Here I’ll show you how to make this cuff as a way of learning the broomstick lace crochet stitch. 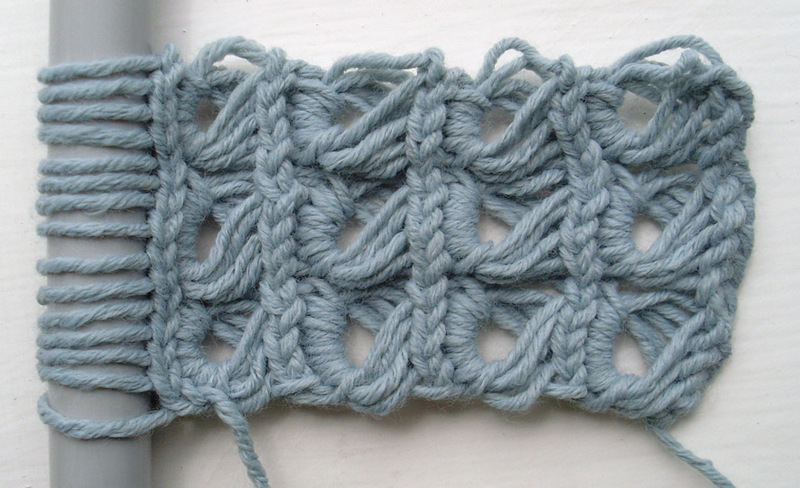 Even though it looks intricate it’s actually quite a simple stitch so jump in and give it a go. The photos for this tutorial are from a left handed perspective but the instructions work just as well whether you crochet left or right handed. Using fluffy or highly textured yarn would be a bit of a waste with this stitch – you need a nice smooth yarn that will show up all the stitches. Select your yarn (you don’t need very much for this small project – the finished bracelet with buttons weighs less than 10g) and a suitably sized hook – here I’ve used bamboo cotton and a 4mm hook. You also need something thicker – the broomstick from the name of the stitch. A thick knitting needle would be perfect because of the tapered point for sliding stitches on and off. I used a 15mm crochet hook. The thicker your “broomstick” the longer the lacy clusters will be. Step 1. Chain 15 and pick up your “broomstick”. Step 2. Pull out the loop on the hook and place it over the broomstick. Using your hook work your way down the chain, pulling a loop of yarn through each chain and without twisting it placing it around the broomstick. Step 4. Turn the broomstick around so the length of working yarn is at the top. Insert your hook under the first 5 loops on the broomstick as shown below. Yarn over the hook and pull under all 5 loops. Yarn over again and through the single loop on the hook. This is a slip stitch completed just once at the start of every row. Step 6. Push this group of 5 loops off the end of your broomstick. Step 7. Repeat steps 5 and 6 for the next group of 5 loops. Step 8. Repeat steps 5 and 6 for the final 5 loops and remove the work completely from the broomstick. Oh dear – it doesn’t look very lacy and swishy like all those lovely photos you’ve seen does it? Not to worry – pick up the work and hold it vertically so the starting chain is in one hand and the row of stitches you’ve just completed is in the other. Pull these rows apart to reveal the lovely loopy broomstick stitches. There’s no need to be gentle – the work should be quite solid and able to withstand some tugging. This is where using smooth yarn gives another advantage as straightening it up is much easier. If it’s being stubborn then pull on individual loops to even them up – again don’t worry about being rough – you can always pull them back – nothing will unravel. Phew! That looks much more like it. Row 1 is complete and you should have 15 stitches. Step 9. pull out the working loop and put it around the broomstick as you did in step 2. Just like step 2 work your way down the row of stitches pulling loops through the work and putting them on the broomstick. At the end of the row you should again have 15 loops around the broomstick. Step 10. Repeat steps 4 to 8 to complete this next row. Continue adding rows until the bracelet fits snugly around your wrist. I needed 9 rows. Fasten off and weave in ends. You could add another row or two and simply slip stitch the work into a ring for a loose bracelet but I preferred it to be snug and actually think the buttons look good and I wear them facing out. If you want buttons then sew 3 onto the front side of the starting chain end. The loops of your last row will act as button holes. This entry was posted in wool and tagged crochet, crochet patterns, jewellery. Bookmark the permalink. I love doing Broomstick Lace!!! Nice job!!! Thank you so much for this pattern. I just made one for my sister-in-law. It crocheted so quickly. I didn’t have a big enough crochet hook or knitting needle so I used my curling iron LOL. That depends a little on the weight of your yarn, size of hook & tension but mostly on the size of “broomstick” you use as that will form the holes. It’s best to make it first and then find buttons the right size.